Create PDF files directly from your scanner or MFP with time saving one-click scanning to PDF. Scan to standard image, searchable, or editable PDF formats. Instantly create 100% industry-standard PDF files with security options that are fully compliant and compatible with all PDF viewers. You can even add bookmarks and transfer hyperlinks when creating PDF documents from Microsoft Word, Excel and PowerPoint. Advanced editing functionality converts PDF files into fluid and dynamic PDF documents complete with full word processing capabilities—all at the click of a button. You gain more editing control and can update PDF documents quicker than ever before. If you must work with PDF document content in other applications, don’t waste valuable time recreating them—convert them. Complex layouts with columns, tables and graphics are faithfully reproduced in Microsoft® Word, Excel®, PowerPoint® and Corel® WordPerfect® documents. Combine files and remove or replace pages with drag-and-drop ease. View and select pages from a source document—such as Microsoft Word, Excel, PowerPoint, WordPerfect, JPG, BMP , TIF, or XPS—to insert into a target document. Just drag and drop the pages add them into the PDF file. 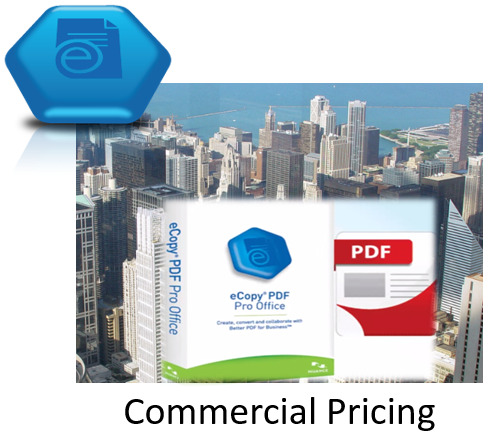 eCopy PDF Pro Office 6 is the smartest value in PDF software. It offers an impressive array of features specifically designed to make you more productive with PDF in every capacity. You get all the PDF tools necessary to annotate, markup, secure and compress PDF plus additional features only available from Nuance for document conversion, search, connectivity and more. Eliminate the frustration of having to re-create or locate an original document to repurpose and edit its contents. Advanced editing functionality converts PDF files into fluid and dynamic documents with full word processing capabilities – right within the PDF software application. With Dragon Notes, you can use your voice to quickly capture ideas and comments directly within your PDF files. Simply speak to create text notes in far less time than it takes to type. It’s a fast, accurate and convenient way to boost productivity when working with PDFs. New connectors allow you to open files from popular cloud services, such as Box, Google Docs™, Windows Live® SkyDrive®, Office 365, Evernote® and Dropbox. Once you’ve made changes, you can send the updated files back to these sites. PDF/A compliance verification is now easier than ever by submitting any PDF file through the Compliance Checker. If PDF fails compliance, report of issues and process to resolve is available at the click of a button. Integrated with the most popular document management systems so that the enterprise users can seamlessly work with their documents within a streamlined process. Note: Performance and speed will be enhanced if your computer’s processor, memory and available disk space exceed minimum requirements. This is especially true when converting very large color PDF files. Hyper-thread enabled or multiprocessor systems can deliver better performance.